Fly Angler's OnLine "Flies Only - 4 - Under Water View"
After making a stage with a millimeter bar for the insects to sit on for their portraits, (as shown in Section Two) my next step was to make it possible to shoot them from below the surface of the water. This was fairly easy as glass boxes like this have been made for years. The only questions for me was how big and how to position it for pictures. I used very high quality float glass, produced the tank about a foot long with the proper angle on the front and suspended it from the ceiling as in the picture here. The top was glass with two black handles for removal. On the bottom I glued sand, regular beach sand with waterproof glue. 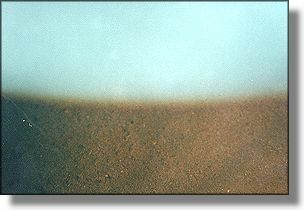 This would be seen in some future pictures when the camera would focus not on the surface, but using the underside of the water as a mirror, would show the bottom when aiming at the surface. This next diagram shows the intended angle for the pictures. At the angle of the doted arrows, a picture taken should show, from the underside, three things. The 'window,' the edge of the widow and, because the camera was focused to that length, the bottom. This is the resulting picture. You will see physics can not be denied, all the parts are there. 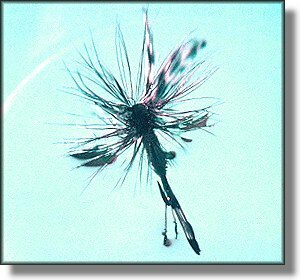 I was now ready to float some flies on the surface, observe and photograph them from below. I will start with my copy of the Adams. Here it is tied with pheasant tippet for the tail. In the next picture the fly is on the edge of the window and turned sideways. Note that when it is, the hook not only shows beneath the surface, but is reflected (mirror effect) on the underside of the surface as it is outside of the edge of the window. Remember a fish sees this as well. A fly at the wrong angle could spoil a take. As the wing is in the window, but on the very edge it is distorted and elongated. This is the place where a fish takes the fly. To allow it to pass more overhead would defeat the proper angle for an efficient rise. Here you have the fly from nearly directly below. At this point the fish has most likely refused it. 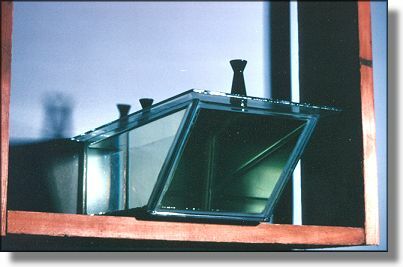 As a fish will maintain the near 45 degree angle of rise and the cone of the window is similar, he keeps the fly on the edge of the window as he rises to the surface. This diminishes the window until the moment of the take, at which time he is blind as his nose obscures the fly. 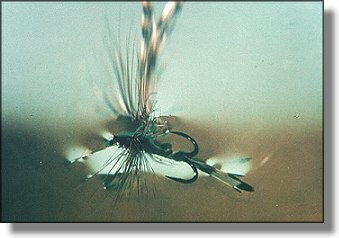 He opens his mouth, water drops down through his open gills and the fly simply drops. 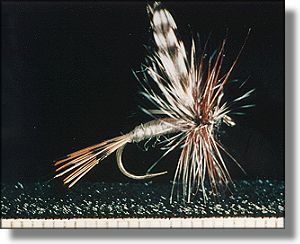 It drops unless there is some (any) drag on the fly. Then you say he has missed. Similar to putting a string on a baseball and watching the outfielder miss it when you pull on the string just as he goes to catch it. Simple physics. Dr. Bert Cushing (FAOL's Stream Doctor) sent these photos of another viewing device. 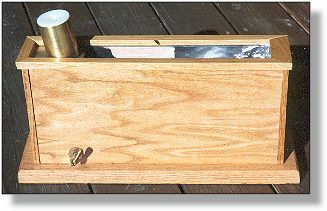 The viewer measure 17" long, 9" hight and 4" wide. It is extremely well constructed; the builder having been involved with robotics for NASA. The main compartment, to the right of the eyepiece is glass lined. It is filled with water. The fly is then dropped onto the water and maneuvered to whatever location is appropriate. Next time . . . the Royal Coachman!